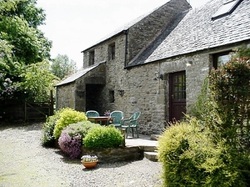 Our self-catering holiday cottage is available for holiday lets all year round. 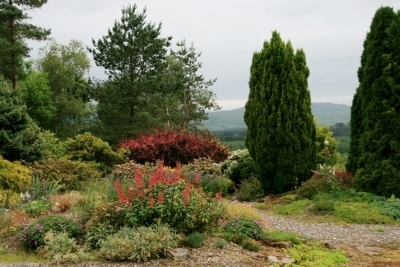 Lovely peaceful setting and tremendous views. Extremely comfortable and well equipped. Sleeps up to 4 with 2 bedrooms, 4 star rating, private access, private car parking area and patio area for sitting out. Contact us please for availability and prices. The main farm house is close-by - handy for queries or help with anything. Very quiet - we have only one cottage. Very historic setting, with stone buildings hundreds of years old. 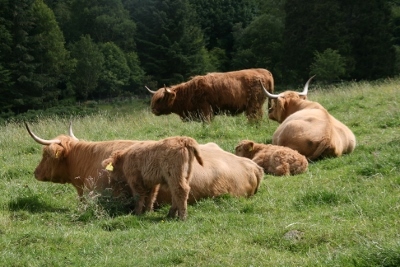 Mid Torrie Farm specialises in breeding Highland Cattle with wildlife and biodiversity in mind. 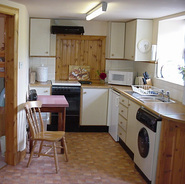 Well equipped kitchen and dining area with fridge, electric oven, microwave, washing/drying machine and dishwasher. Freezer upstairs. Main entrance is from the patio area into the kitchen which looks east. The doorway on the farmyard side is for occasional use. 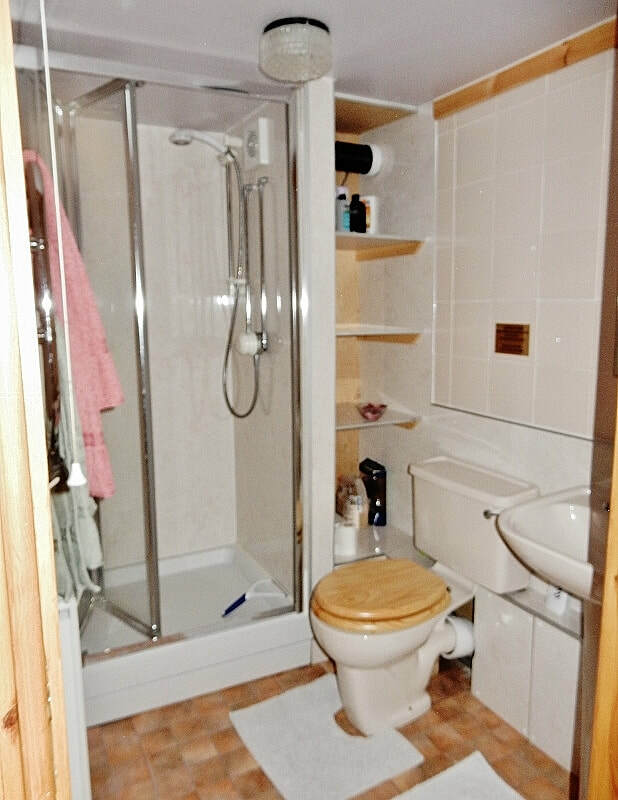 Entrance lobby and shower room with WC. Sitting room, very comfortable with sofa and armchairs, TV, reading lamps and so on. Good collection of books, special vintage video collection, and games. All bedrooms are fully carpeted and well equipped with drawer/hanging space for clothes, dressing tables, lights and mirrors etc. 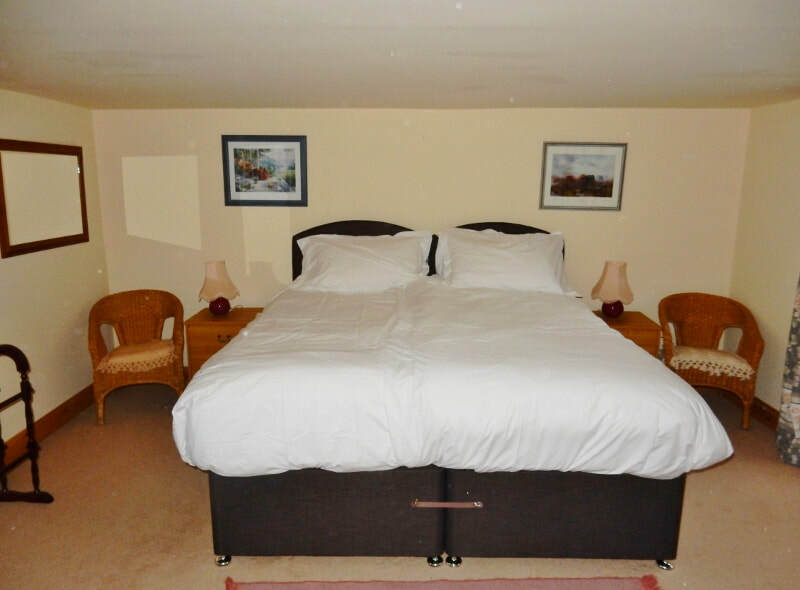 Beds are made up for your arrival to your specification. The price includes bed linen, towels and electricity for cooking, lighting and other appliances. The first £20 worth of lpg for heating and hot-water is also included. Extra gas for heating and hot water is metered & charged for at cost (currently £1 / cubic metre) at the end of the holiday. This could mean another £1 to £7 for a week during the summer months, and £12 - £25 during winter. The cottage is not suitable for children under the age of seven because of the garden ponds and semi-open staircase but please do bring them when they are a little older! 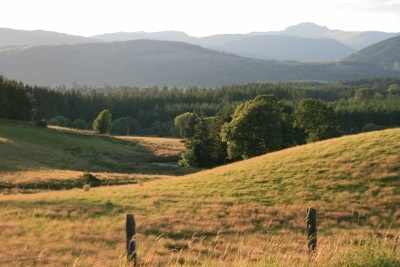 Activities in the area : Fishing, golf, cycling, walking, Scottish history, genealogy (we can help), horse riding, visiting gardens open to the public. Excellent for bird lovers - 97 species recorded here on the farmVery interesting geological history to the area, with the farm situated on drumlins and glacial deposits from 10,000 years ago. 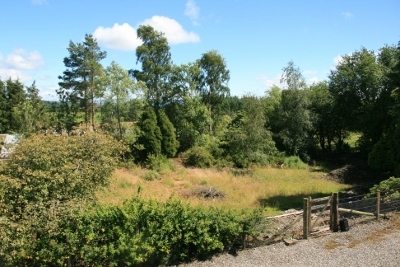 Location: Only three miles (5km) from Callander which has good places for eating out, shops and leisure centre. 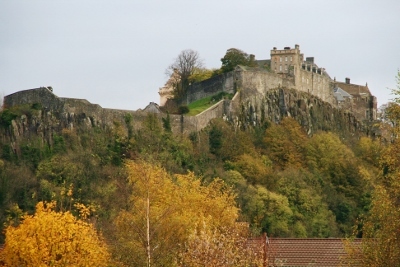 11 miles (19 km) from Stirling, and within an hour's drive of Edinburgh and Glasgow. Well located for exploring much of Scotland, including St.Andrews, Glencoe and West Coast, Inverness and the Highlands between. Guests receive a warm welcome and short guided tour of the accommodation on arrival. Bookings are normally weekly, Saturday to Saturday,but discounted short breaks are available mid-week and weekends during low season, from November to April. Arrival time normally 4pm onwards, departure by 10am to allowance to prepare for new guests. Availability and bookings: please phone or email us via the contact page to check availability/prices, with discounts usually offered to couples and for late bookings. Booking forms available on request. £120 deposit is requested when booking, with the balance of the price due 30 days before the start of the holiday. We've met many lovely people amongst our guests and several have come back time and time again or have recommended our cottage to friends and family. Members of the Association of Scottish Self Caterers. 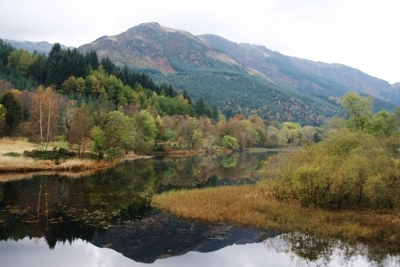 Southern end of Loch Lubnaig, 20 minutes away.